Jenny of Bloom Designs Online put together a fun and bright, You Are My Sunshine birthday party that is fun beyond words. 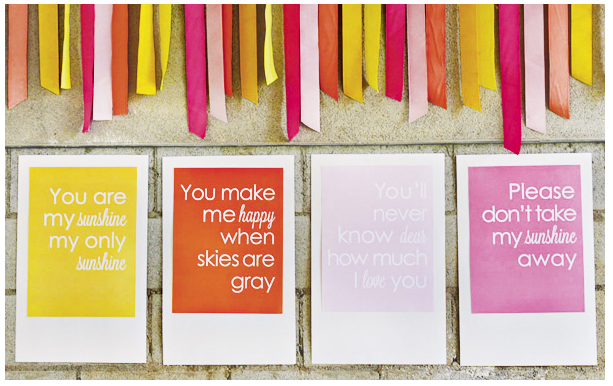 I am so in love with the idea of these posters with the lyrics on them I think I might make something similar for the room my two youngest share, in a different color scheme. You can check out all of the fun and colorful You Are My Sunshine birthday party ideas over at Hostess With The Mostess. What a surprise! Thanks for sharing my party.